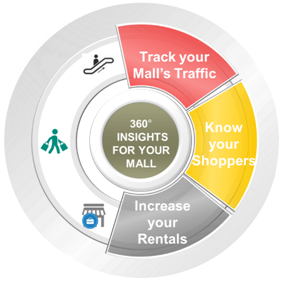 The ShopR360® solution increases the usability of your existing CCTV infrastructure by extending its use beyond SLP (Security and Loss prevention) to continuously measure the traffic patterns in malls – so that you can substantiate the value of each retail space within your mall, get the best tenant mix, and win a competitive edge for your mall. In addition, the extended utilisation of your existing infrastructure dramatically lends the benefit of faster amortization of capex. 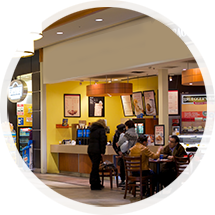 Track all visitors throughout the mall premises – including aisles, atrium and other common areas, entrances, escalator and car park entrances. What’s more, you can demonstrate the volume throughout the day, week, month and year. The traffic down each aisle determines the value of the retail spaces. This makes it easier for you to take informed strategic decisions, and sell every sq. ft. of space in the most profitable manner. Have a pulse on where your shoppers are spending the most of their time in the mall, and use this insight to cash in on the “popular” zones – be it for promotions, kiosks, festive decorations, etc.What’s more, you can also ensure mall staffing and infrastructure are well aligned with customer traffic to ensure happier shopper experiences. Measure journeys taken by the visitors within the mall on aggregate level. Get a quick view of areas that are more frequently or least visited with visual and intuitive journey heat-maps.You can identify dead zones and start diverting consumer traffic to such areas by planning tenant mix optimally. You can also track the paths taken by a specific visitor – shops visited by him/her on a sample basis (visitor identity is not revealed). Location is critical to the success of your promotions. Measure which are the best spots for promotions basis the dwell times and customer traffic. 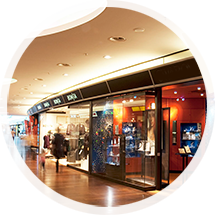 Understand how your mall traffic is interacting with your promotions and modify them accordingly. 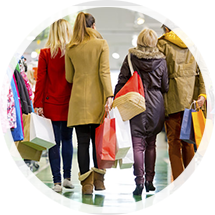 Measure how many repeat visitors and how many loyal customers are visiting the mall premises.You can also know when a loyal visitor has arrived at the mall parking so that you can target him with specific promotions or offers in the mall. Measure the traffic for your tenants. Know if anchor tenants are really driving traffic to the mall or not.The diagnostics thus achieved, on various brands will provide significant and measurable insights on whether the brand is using space optimally within the mall – so that you can adjust rentals accordingly. 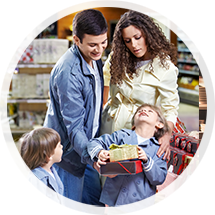 The ShopR360® data becomes your arsenal to not just plan your operations but help your existing tenants “up” their retail game. 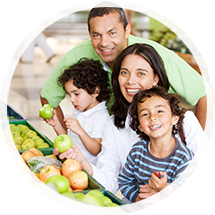 By providing tangible footfall and shopper journey metrics, you can help them gain the most out of their retail space by taking appropriate and informed remedial measures. This will increase the “value for money” for your space and get you the best deals from your tenants!